UPPER & LOWER DOOR HINGES. 00-06 Fits BMW X5 E53 OEM Rear RH Passenger Upper Lower Door Hinge Mounts 8265164/8265168 G1239. X5 E53 All SAV Hood Seal Clip. 7’ E65 745i Sedan Hood Seal Clip. 750i Sedan Hood Seal Clip. 760i Sedan Hood Seal Clip. Alpina B7 Sedan Hood Seal Clip. If BLANK, we just know this item will fit the donor vehicle which is a 2005 X5. Rear Upper and Lower Door Hinges Set. TESTED AND IN WORKING CONDITION. We take pride in our work and we hope it shows when you receive your part! Donor vehicle: 2012 BMW X5 E70 3.0L I6 GASOLINE AWD. All parts sold by Advance Motors LLC bear a permanent identification mark and we will not take any part back if this mark is missing or altered in any way. DOOR HINGE MOUNT FRONT RIGHT 82651589 OEM. 00 01 02 03 04 05 06 BMW X5 E53. 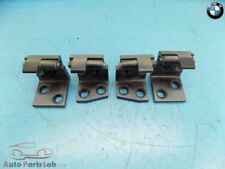 DOOR HINGE MOUNT FRONT RIGHT 8265149, 8265157 OEM. 00 01 02 03 04 05 06 BMW X5 E53. DOOR HINGE MOUNT REAR RIGHT 8265170 OEM. 00 01 02 03 04 05 06 BMW X5 E53. 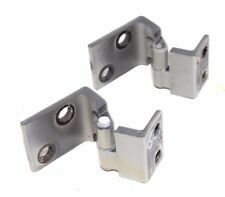 This kit replaces your existing door hinges by directly bolting onto the holes. 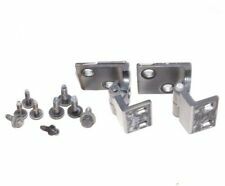 If your door has power locks or windows, you may or may not need to extend the wires going from the door to the chassis depending on how much slack there is but this is a very simply process with the wire extension kit, which is included for applications that require it. Model: BMW X5. Front Door Hinge. If you have any doubts - check with your local dealer or other sources to make sure that you're purchasing the right part. We're not responsible for installation errors, labor expenses and/or any other expenses that may occur. Model: BMW X5. Rear Door Hinge. We're not responsible for installation errors, labor expenses and/or any other expenses that may occur. Model: BMW X5. Rear Door Hinge. If you have any doubts - check with your local dealer or other sources to make sure that you're purchasing the right part. We're not responsible for installation errors, labor expenses and/or any other expenses that may occur. X5 3.0d M57. X5 3.0d M57N. X5 3.0i M54. X5 4.4i M62. X5 4.4i N62. X5 4.6is M62. X5 4.8is N62. New BMW Left Lower Front Door Hinge. 10 PCS Car Keys. Includes One Set For10keys to help open all kinds of cars and many other devices. Durable to Use. 10 PCS Car Keys. Includes One Set For10keys to help open all kinds of cars and many other devices. Durable to Use. Color: Silver. 10 x Car Keys. Includes 10keys to help open all kinds of cars and many other devices. Otherwise deal is final. All products are quality checked. (Not Fit the Door In The Shape Of Right Parenthesis). These Door Guards Will Protect The Door Of Your Vehicle From Scratches And Abrasion. Auto accessories. other Auto parts. Motorcycle accessories. 4 - 8 weeks to Italy, Brazil ,Russia. (Not Fit the Door In The Shape Of Right Parenthesis). These Door Guards Will Protect The Door Of Your Vehicle From Scratches And Abrasion. Auto SUV Door Hinge Pins Bushing Kit Fit For Chevy Silverado GMC Full Size Truck. These Door Guards Will Protect The Door Of Your Vehicle From Scratches And Abrasion. (Not Fit the Door In The Shape Of Right Parenthesis). Car Protection Sticker. Car Cleaning tools. All products are quality checked. BMW 1 Touch Window Unit Feature :: Add One Touch Windows / Sunroof To Any BMW! Feature :: Works With Factory Switches Feature :: Easy Installation Feature :: Microprocessor Controlled Feature :: Designed In The USA. These Door Guards Will Protect The Door Of Your Vehicle From Scratches And Abrasion. (Not Fit the Door In The Shape Of Right Parenthesis). Installation: Stick on with pre-attached 3M tape. 10 PCS Car Keys. Color: Silver. Trending at $7.51eBay determines this price through a machine learned model of the product's sale prices within the last 90 days. 10 x Car Keys. Includes 10keys to help open all kinds of cars and many other devices. Durable to Use. Hope you can understand. We will assist you in any way possible and aim to answer. we will replace a new one. Includes One Set For10keys to help open all kinds of cars and many other devices. Durable to Use. Color: Silver. Hope you can understand. 10 PCS Car Keys. we will replace a new one. in good condition before dispatch. Includes 10keys to help open all kinds of cars and many other devices. Durable to Use. Hope you can understand. 10 PCS Car Keys. We will assist you in any way possible and aim to answer. we will replace a new one. Includes 10keys to help open all kinds of cars and many other devices. Durable to Use. Color: Silver. Hope you can understand. 10 PCS Car Keys. we will replace a new one. in good condition before dispatch. (Not Fit the Door In The Shape Of Right Parenthesis). These Door Guards Will Protect The Door Of Your Vehicle From Scratches And Abrasion. Auto accessories. Motorcycle accessories. Car Cleaning tools. (Not Fit the Door In The Shape Of Right Parenthesis). These Door Guards Will Protect The Door Of Your Vehicle From Scratches And Abrasion. Wish we have a good cooperation. 4 - 8 weeks to Italy, Brazil ,Russia.